Spring has already made an appearance in the city: we have more daylight hours and days are longer, we keep our coats, the sun heats up and new colors appear in our daily lives. Definitely, one could say that the city is reborn after a few months of lethargy. With these warmer temperatures slightly more fancy eating something a little less forceful and heavier than the typical hot dishes last season. Thus, we propose to welcome spring with this delicious salad cecina. Although not usually one of the most common ingredients in salads, the Lion smoked beef It is a very versatile food and taste fits perfectly with the other ingredients. We are facing a new alternative to incorporate into our salads. Typical cherry color brings a distinctive touch to our plate: a combination of very appealing to the eye and very spring colors. Best of all is that this delight slimline. 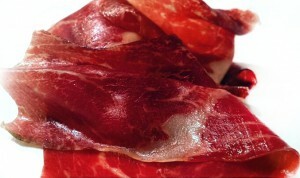 Jerky is a food that has very little fat and high protein. It is ideal for appetizers and first courses summer and spring, when the heat and we want something lighter. 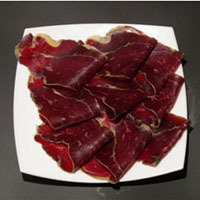 A "carpaccio" jerky seasoned with a jet Extra virgin olive oil It is a good example. The preparation of this recipe is very easy, simple and quick to make. In a few minutes we will have ready with a fresh light and tasty dish ideal starter or dinner. Ingredients: lettuce, Arugula and other varieties of mesclun salad; Jerky cut sliced, mango, cherry tomatoes, oil, balsamic vinegar, Duck foie the goose foie (to taste) and goat cheese. Preparation: In a bowl put the well clean lettuce and oil aliñamos, vinegar and salt. Add the cherry tomatoes, halved, the handle thin strips, Jerky and foie. If we want a slightly stronger result, we can add goat cheese, which it is complemented very well with corned enhancing its flavor, in addition to exceptional contrast with the handle. To be more mellow eating, pass the cheese in the pan 30 seconds each side over high heat until slightly toasted. We can finish the whole dish flavored with a good virgin olive oil, and we would have our salad ready to eat. The intense smell, smoky flavor and salted biltong goes well with sweet mango, providing us with a curious combination of flavors. Biltong flavors and foie provide us moves away from the typical salad of lettuce and tomato lifetime. This recipe is great for dinners or meals that do not have much time but also want to eat something nutritious and healthy. Salads are a very versatile dish, you can do many things and for all tastes, it is virtually impossible to get bored of them. It is also a very handy when it's hot dish. To accompany this dish cecina, We can opt for a young white wine: a vino Verdera blanco or Sers Blanqué. For a more cooling effect cava is a good choice, such as a Cava Brut Nature Vilamajó. You can find the best beef jerky for your salads and the best products to accompany our Store in Barcelona the our shop.